This blog post is a co-production of Oklahoma Today and I Ate Oklahoma. The crack of the bat! The smell of the grass! Parking lots! Those are some of the things people associate with baseball, which seems weird. 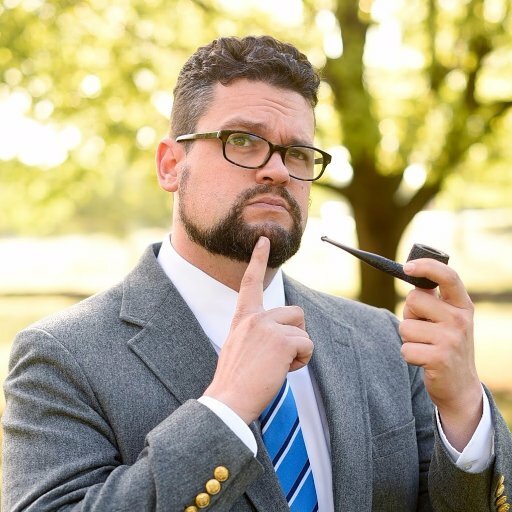 Don’t smell that grass; you have allergies! 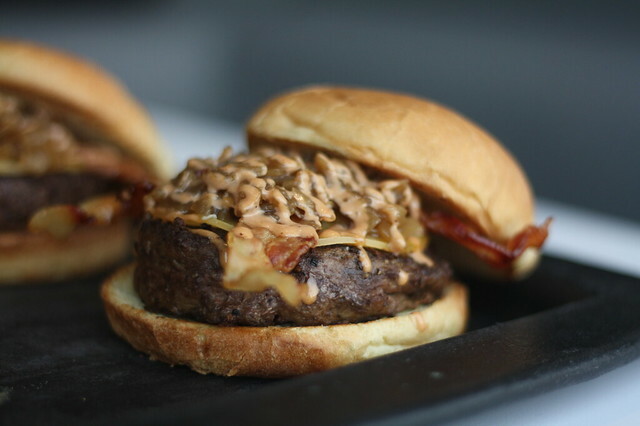 Early versions of this bacon, cheese, and bourbon-sauteed-onion burger had three slices of gouda on it, according to executive chef Will Fenwick, but it was too much. Too overpowering. So they adjusted to two slices. Finally, one slightly thicker slice was chosen, and it’s the perfect balance of flavor and texture. It’s just thick enough to hold onto the burger (a really nice, thick patty) without fully melting and get goopy. The bacon is crispy and the onions are so good they ought to be on just about everything else they serve. Remember that Saturday Night Live ad for “Taco Town”? 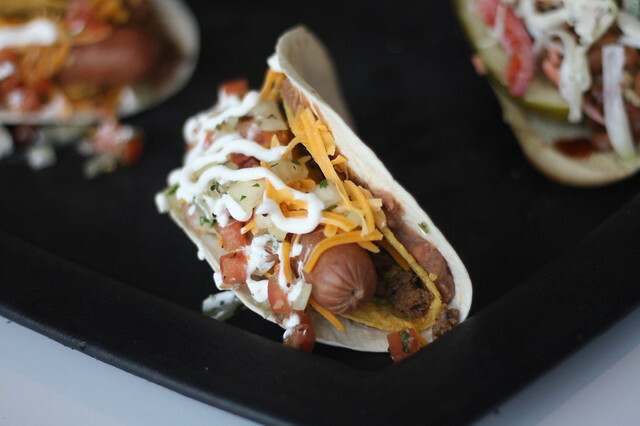 The Brick’s new Taco Dog feels like it was stolen from the middle of that nesting doll of a meal. Outside: Flour tortilla then a smear of refried beans and a crunchy corn shell inside that. Pico de gallo. Sour cream. Taco meat. Cheese. A hot dog. Sure, they aren’t wrapping it in a blueberry crepe and tossing it in a commemorative tote full of vegetarian chili, but it’s still a lot to fit in your mouth. 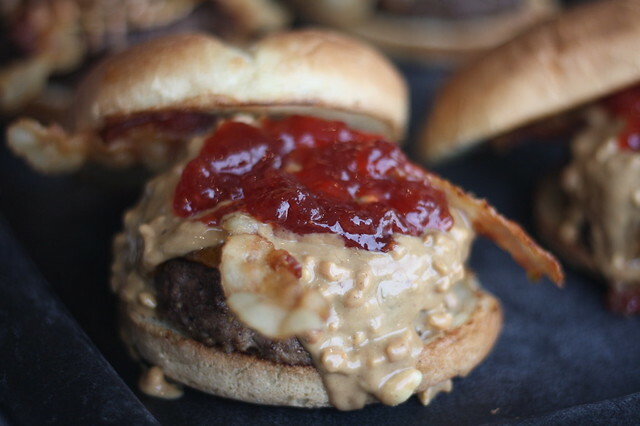 Take that thick-thick beef patty from the Gouda Burger, but slather on crunchy peanut butter, a dollop of strawberry jelly, and a couple of pieces of crispy bacon, and what do you have? Nothing. It’s already gone, because I ate it. You shouldn’t have wasted time trying to solve my riddle while I went hog wild on that burger. Rookie move. No, this does not have those bourbon-sauteed onions, I’m sad to report. 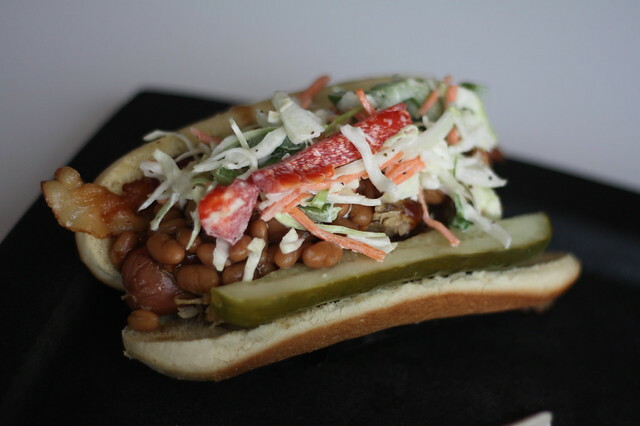 Instead, this all-beef hot dog is piled high with comfortable Southern classics: pulled pork, baked beans, crunchy slaw, and a fresh dill pickle spear. 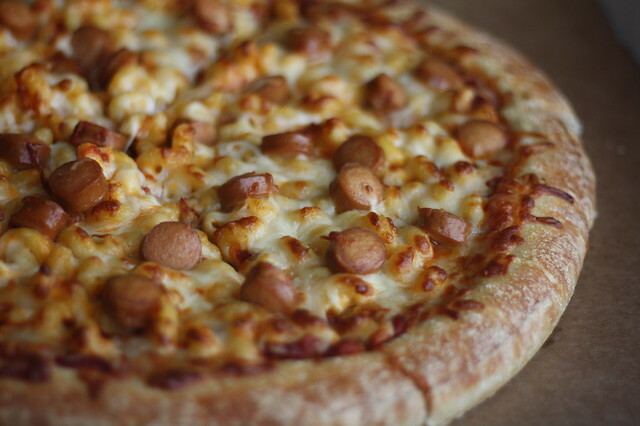 This is messy, to be sure, but it’s also one of the best-balanced dogs I’ve eaten in a while. Hot dog spicing can be very assertive, but the lightness of the slaw and the tart pop of the pickle keep it from overpowering the rest of the ingredients. Especially during an unseasonably warm spring scorcher, this is the dog you want alongside that massive collector’s cup full of COOP beer while watching our OKC Dodgers crack bats, sniff grass and park . . . that ball over the right field fence. For more excellent Oklahoma food coverage, visit IAteOklahoma.com.